when the stations would sign off, the National Anthem had been played. ex: The mumbo-jumbo gave me the fantods. So, maybe the heebie jeebies, or cause to pause, or that prickle on the back of the neck? All of these and more. As a writer, I found that fantod opened new windows in the house of poetry. I wanted to try being a poet of fantod, even just for awhile. What is a prose poem? Is there such a thing? I never used to believe that prose poems were real. Prose was prose and poetry was poetry, simple enough. But a few years back I ran into a book declaring me to be wrong. Oh no, the author did not name names, narc-ing me out to the rest of the writing world. 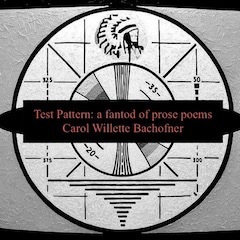 What did happen was that I read some amazing prose poems and also, thanks to Rose Metal Press, read why they are real and what makes a prose bit poetry. Fantod, meet prose poem, meet prose sonnet! This interesting collection of poems was written mostly on an island off the coast of Maine. 21 of the poems were. They were written largely due to the wonderful (somewhat creepy) art of Edward Gorey. His Fantod Pack of tarot-style cards inspired me to let go of my usual poet-inhibitions and allowed me to free fall and gyre around the outer edges of my known universe. I found it easier to noodle verbs and nouns into other parts of speech, to leave my reader suspended over normalcy in terms of phrases and jarred realities. I felt so free. I hoped my readers would too, all the while scratching their heads. Let me be clear… I did not set out to confuse as much as to confound. The writing of fantods brought to my writing a newfound sense of danger or adventure. I have persisted in writing this way long after the manuscript was done, submitted, and accepted for publication. It seems to me that in this rather wildly abandoned way of writing, a certain level of Truth emerges. It is good to be able to free-associate when writing, which I do anyway in my daily free-writes. In terms of the prose sonnet, I embarked upon a way to combine the form (sonnet) with the prose poem so as to both honor the original form and to break it open.The examples I found of prose sonnets did not stick tightly to many of the elements of sonnet, but I decided to try. Hence I often keep track (in the poem itself) of 14 elements, by numbering those. It is optional whether to read the numbers aloud when reading the sonnet aloud. I also decided to keep the tradition [of Shakespearean sonnets] that calls for a volta or turn/change somewheremid-poem. Somewhere around element nine or ten the poem turns on itself and goes in a different direction, creating an interesting tone. Lastly, I decided that there ought to be a rhyme of the final words in elements 13 and 14. 1. Her wings are made of wire, twisted silver mined at midnight. 2. She is a witch in butterfly skin, metallic in the moonlight, invisible by day. 3. Her thorax is a rare star ruby, glows when she is spell-casting. 3. Her mother warns her to use her powers only on even-numbered days in months without 31 days. 4. Her many fathers encourage her to avoid the rules for spells. 5. Her sisters call her the Passionflower Priestess. Her brothers cannot speak. 6. She has a third eye, just to the side of her mouth. It is hidden in daylight, opens like a shade at night. 7. The hour in which we lie awake. 8. The hour after a boating accident. 9. The hour after your lover departs. 10. The hour after childbirth. 11. This is not when she is doing evil. This is not the day after the day of the dead. 12. This is the hour of gypsy, of meander, of disappearing. 13. Her legs are glacial, as her breath is glacial. She can touch down on a small child and change her into a selkie. 14. This is butterfly’s majesty . See if you can find the elements in the poem. Want to discuss fantods, prose poems, sonnets? Free admittance to an indiscretion. Loss of saliva. Escargot trails through a sunbeam. Eyelid clutter. Nose hair bleach. Forever stamp licked clean. Deaf à cappella choir. Ferns take root on a field trip to the desert. Edward and Lemony playing an incidental game of cribbage. Loss of wits. An argument in a piano. Ice sculptures in August. Silly Putty cartoon characters day trip to the beach. Overdoses of imprisonment. Undertakers of overtaking. Ravens riding unicycles across the tundra. A priest and a rabbi walk in to a seance — disappear.